Lotte and her little sister Roosi decide to go find the fire-breathing dragons. After several adventures, Lotte and Roosi find their way to the dragons. Surprises await them there. 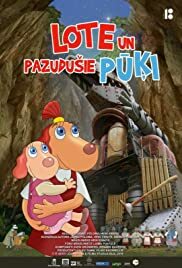 In this third film of the series of Lotte films that children know and love, the spirited girl dog Lotte gets a little sister named Roosi. Karl the raccoon and Viktor the fish are scientists who come to Gadgetville. They are taking part in a big folk song collecting competition. Whoever succeeds in recording the folk song of the world's oldest animal species, the mythical fire-breathing dragon, wins the competition's grand prize. Lotte and Roosi decide to help the scientists. Exciting and unexpected adventures await the sisters.